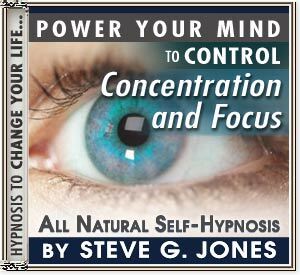 LEARN HOW TO CONCENTRATE AND FOCUS WITH HYPNOSIS!!! Hypnosis has a unique way of organizing thoughts and clearing out the clutter. Too often, people are diagnosed with Adult Attention Deficient Disorder and are led to try different mediations to get their focus back. If you can’t seem to make a decision or are constantly jumping from one task to another, then hypnosis can work to make your concentration and focus stronger and help you accomplish more without the use of drugs. There are many situations in which concentration and focus are imperative: driving a car, performing surgery, working on an important project, taking a test. Often we have trouble concentrating on the task at hand because there is so much more going on in our minds: did I turn off the coffee maker, I need to mail the electric bill, the kids need dentist appointments, what will I do if I don’t get that promotion. All these dialogs going on simultaneously in you head make it nearly impossible to get anything done at times. The process of hypnosis to create better concentration and focus can be divided into two main areas. First, you need to learn how to really relax -- to allow all thoughts to be put aside and no conscious thought to take center stage over another. This is one reason why hypnosis is usually done just before drifting off to sleep at night, when you can put aside other distractions. Secondly, once relaxed, hypnosis can rearrange and organize thoughts so that logical action can take place. One way to understand how hypnosis can increase concentration is to think of your mind like a computer hard drive. If every file you ever created or every piece of information stored on your computer was just placed on the desktop, you would have a hard time focusing on paying your bills if all of your appointments and letters to everyone you have ever written to were mixed in with each of your banking transactions. Dr. Steve G. Jones M.Ed. is a clinical hypnotherapist and has created a self hypnosis program called Concentration and Focus. Within 3 weeks you will be able to clear the clutter and focus on the things that will help you accomplish all your goals. This will give you the jump-start you need!! !